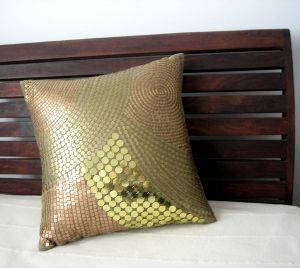 A cushion cover made from art silk and intricately embedded with copper and golden sequins will create a wonderful ambiance in your home. A cushion cover made from art silk and intricately embedded with copper and golden sequins will create a wonderful ambiance in your home. This cushion cover depicts flawless craftsmanship of an Indian artist who has beaded every sequin individually with his own hands. This cushion measures 16" x 16" in height.